Fungeon Party Review — GamingWithSwag.com - Dads By Day, Gamers By Night. You, and up to four other friends, embark on a journey through a mysterious dungeon with wands and dice at the ready, questing for experience along the way. Sounds like a perfect high-fantasy, tabletop RPG setting to me. This adventure, however, is more about your accuracy with scooting dice along the table, doing quick math, throwing dice at each other and stacking things on various body parts. I repeat, this is definitely NOT an RPG. After each player randomly selects the character they’ll be playing from the following options: barbarian, bard, cleric, paladin, ranger, rogue or wizard, they’ll grab a couple hit points and an ability point to get started. From there, it’s time to select the first 6 quest cards that you’ll be challenged to complete. These cards make up the dungeon you’ll be heading into. Fungeon Party is a BYOT (Bring Your Own Timer) game, so fire up your timer app on your smartphone and flip the first card over. You have 3 minutes to complete all 6 cards, so 30 seconds on average. The rulebook does state that new players should add a couple minutes to the total time for your first play throughs, until you get the hang of it. You take damage for each of the 6 quests that you don’t complete, distributed around the party however you choose. You gain XP for every completed quest, whether or not you fail the dungeon as a whole, and your characters can use that XP to level up and gain more hit points and ability points. The XP is shared though, meaning, if you earn 6 XP, you have to choose who in the party will get it (don’t you dare give it to the bard)! As soon as one player dies, your dungeoneering is over, so balancing the hit points and healing abilities is key. Usually RPG style rulebooks are thick tomes of information; lore, definitions and stats. There are appendices on top of appendices and full pages dedicated to character art. Not the case with Fungeon Party, and that’s because it ISN’T an RPG! You’re looking at a streamlined, 7-page booklet with the perfect amount of instructions to help you get dungeon diving as quickly as possible. Because most of the details are on the quest cards themselves, you really just improvise until you become a seasoned “Fungeoneer”. The art theme is whimsical/comic fantasy (see rulebook cover image). It is very apropos to the different quests that are in the game, for instance, stacking dice on your forehead or pushing dice up ramps with magic wands. Perfect for a party game, the set up is super easy. It really just boils down to randomly selecting a character card, setting up a timer and shuffling your quest cards. Can’t get much easier than that! “Magic Wands” which look like cardboard tongue depressors, used for scooting things around or for tests of balance. 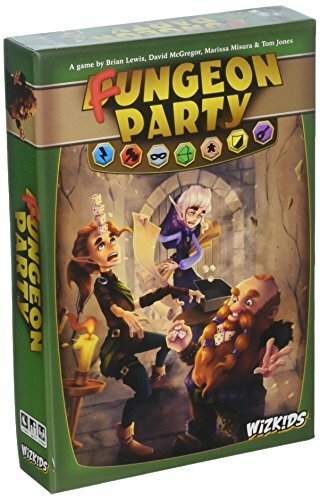 There is no official solo-play option for Fungeon Party as most of the quests require either more than 5 dice or more than one player. It wouldn’t be difficult to homebrew a solo-play mode though, give it a try and let us know what you come up with! If you go into Fungeon Party in the mindset that it is going to be a robust RPG board/tabletop game, you will be disappointed. However, if you decide to play the game as a fun, goofy, fast-paced party game, you’ll find yourself pleasantly surprised. Thirty seconds per quest card seemed at times to be an impossible goal to reach, but after a few play throughs, the quest patterns were easier to distinguish and more fun was therefore had. The RPG aspect of the game is extremely shallow, and really just used as a vehicle for that ever-popular fantasy theme. I really liked how the cooperative nature of the game promoted teamwork and garnered more enjoyment as a result. With everything taken into consideration, I’d suggest to buy this game on sale. For me personally, the party game format isn’t really my go-to, so all those party people out there may disagree and say that this one is worth more than full price. YMMV!